SANTA CLARA, CA--(Marketwire - March 8, 2011) - Today at the Cloud Connect Conference, Nimbula, the Cloud Operating System Company, announced that its flagship product, Nimbula Director, will be generally available within the next 30 days. Based on Nimbula's Cloud Operating System technology, Nimbula Director delivers Amazon EC2-like services to both enterprises and service providers. 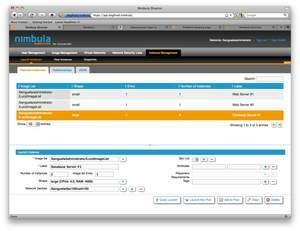 Allowing customers to efficiently manage both on- and off-premises resources, Nimbula Director quickly and cost effectively transforms inflexible, inefficient and under-utilized data centers into powerful, easily configurable compute capacity while supporting controlled access to off-premise clouds. Nimbula Director provides powerful utility-grade cloud features like policy-based authorization, secure multi-tenancy, topology-independent distributed network security (enabling multi-data center scale and while allowing for self service deployment of complex network topologies) and monitoring and metering (enabling next generation, usage driven cost models). "We made our beta software publicly available last December and have since been working with a strong, dedicated community of enterprise and service provider beta testers," said Willem van Biljon, Co-Founder and VP of Products at Nimbula. "Their commitment and feedback has helped us prepare for our general availability in the best way possible." "We have been working with the beta version of Nimbula Director and have been very pleased with the software functionality, quality and the team's support," said Eli Feldman, VP of Technology Solutions at EPAM Systems, who is a leading global software engineering and IT consulting firm. "We will be using Nimbula Director as the foundation of our internal and customer facing cloud initiatives."